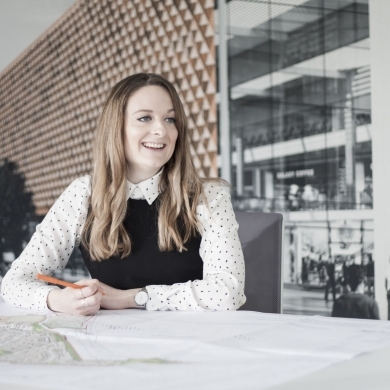 Women in Property announced on 1st March its new South Wales Chairwoman as Sara Ifan, Senior Architect at Powell Dobson Architects in our Cardiff studio. As a Senior Architect, her recent focus has been on regeneration projects, private residential and affordable housing schemes. She was named Young Achiever of the Year 2016 in the Constructing Excellence Wales Awards, also volunteers as a construction ambassador and contributes widely to events that promote the industry in young people. She said "Our focus is to help corrent the gender imbalance in the property and construction industry, of which only 15% of the workforce is female. Positive changes are being made in the industry, and our aim is to continue to work with businesses and other ogranisations to help them understand how they can move towards a diverse and inclusive working culture." "Our network links members to fellow professionals across sectors and across the UK. We are multi-disciplinary, encouraging an exchange of ideas and sharing of expertise and, critically, we nurture the younger generation, those girls who would thrive on a career in the industry but don't know how to go about getting there. This is all about aspiration, success and inspiration." Ann-marie Smale, managing director of Powell Dobson added "We are delighted to support Sara in her forthcoming role as chair of South Wales Women in Property. Sara has been a huge asset to Powell Dobson since she joined us in 2011 and has a very promising future with us." "She is a fantastic role model to other girls and young women who might be considering a career in the property and construction industry. We wish her every success for this year ahead."